The room was clean but a bit dated. I had asked for a ground floor room when I booked my room on Booking.com but when I arrived the room I received was on the 3rd floor. Thank goodness there was an elevator. The breakfast in the maids staff were Very nice and helpful. The bed was comfortable, breakfast was great. The room a little stuffy. Overall the stay was great. The best thing about this hotel is the staff. They have excellent customer service, from the manager -Aaron-, to the receptionist -Angela-, to the maintenance staff -Mr Pedro-, and cleaning staff -Ms Nancy-. They are all very professional and go out of the their way to be accommodating and make your stay as pleasant as possible. Location was good - close to our family in Altadena. Breakfast was very good - lots of choices for everyone. Room was clean, comfortable and had all the amenities that we expected. We have stayed here a couple of other times, and it has always been just fine. We liked this room better than past rooms. Very friendly and helpful front desk. Breakfast was adequate but too small of an area for all the guests. For the location it was a good price, rooms better than what I thought it might be as in and older part of town. It was quiet, and staff were friendly. The only thing i like about this place is the Staff was friendly and it was at a convenient location because i was there to run the Pasadena Half Marathon at the rose bowl. 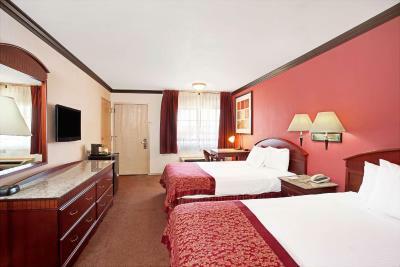 Ramada by Wyndham Pasadena This rating is a reflection of how the property compares to the industry standard when it comes to price, facilities and services available. It's based on a self-evaluation by the property. Use this rating to help choose your stay! Rooms at the property offer a microwave, a refrigerator, and a cable TV. Coffee makers are also standard in each room type. High speed internet access is available throughout the property. There is also a fitness center and a 24-hour front desk. Ramada by Wyndham Pasadena is located only a short distance from some of the area's main sites, including the Norton Simon Museum. Los Angeles city center is also only a short drive away and is easily accessible with nearby area motorways. 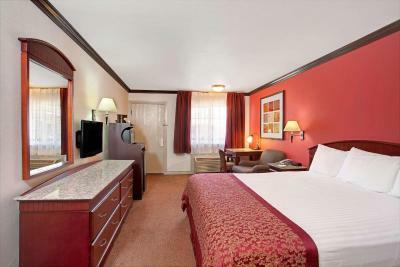 When would you like to stay at Ramada by Wyndham Pasadena? 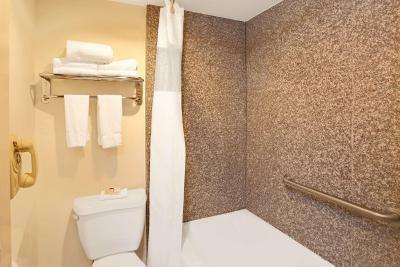 This air-conditioned room includes a work desk, a coffee machine and an private bathroom. Please note: A balcony is available upon request for this room type. 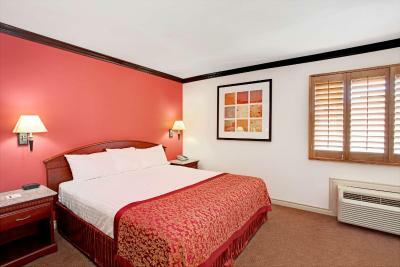 This double room features a cable TV, a microwave, a refrigerator, an iPod docking station, and a coffee maker. This room features a cable TV, a microwave, a refrigerator, an iPod docking station, and a coffee maker. This double room features a sitting area, a cable TV, a microwave, a refrigerator, an iPod docking station, and a coffee maker. House Rules Ramada by Wyndham Pasadena takes special requests – add in the next step! 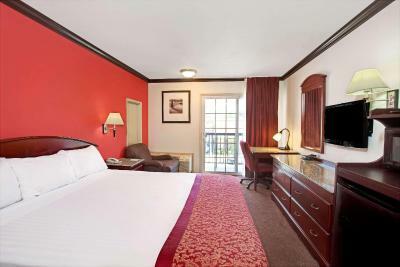 Ramada by Wyndham Pasadena accepts these cards and reserves the right to temporarily hold an amount prior to arrival. My room smelled of cigarette smoke and the coffee in the room was awful. The carpet was stained the bathroom didn't look like it was clean shower curtain was stained water dripped. The sink didn't drain right away and smelled like sewer. Check in was fast and easy. There was a mouse in my bathtub. No front desk staff assisted me with ridding the Room Of the pest. I got no sleep. Also, I was charged for my 3rd guest. The application did not offer more than 2 adults to be in the Room. The front desk charge me $20 additional to the $100 deposit and the $115 Room charge. The staff was not friendly. Nor welcoming. 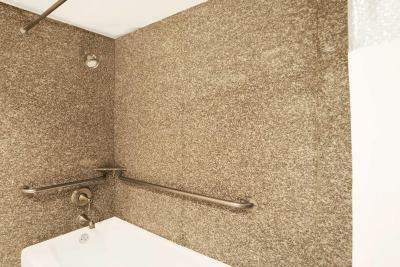 The shower was complicated to use. They still haven't refunded my deposit and it's been three days..